Waistlines Go West in Western Australia! The bounty of the Margaret River region of south west Western Australia is renowned for its quality, freshness and lack of food miles. There are more than 120 wineries, eight breweries and a multitude of food producers to visit. Several companies offer culinary and winery tours of the region but if you’re an independent traveller it’s easy to plan your own itinerary. We spent a day driving through fertile farmland and small country towns sampling gourmet delights and enjoying a range of fresh produce; here’s our list of ten great places to eat and drink in Margaret River. The viewing windows at this chocolate factory allow you to see chocolate bars and truffles being made by hand while friendly staff members wander round bearing trays piled high with samples for tasting. With 200 different chocolate creations to choose from, taste testing is essential in order to help with the decision making process. That’s our excuse anyway! We chose chocolate with Jamaican coconut…and chocolate with sea salt caramel…and chocolate with cashews…and Rocky Road. Enter gourmet food heaven when you walk through the doors of Providore. Jams, chutneys, sauces, salad dressings and olive oils are amongst the more than 40 home made products available here. Each day different foods, all produced on site from ingredients grown on the farm, are available to taste. Outside, wander through the extensive orchard, olive grove and vegetable garden with the free range chickens for company. Our recommendation – Sambarino After Dinner Mint Chocolate Liqueur. Divine! There’s more to this brewery than the five beers and one cider produced here. The café serves delicious food, there are regular live music gigs and visitors can learn about the history of the brewery in the small upstairs museum. We enjoyed a generous serve of beer battered chips and a luscious slice of hazelnut and sticky date cake by a warm pot belly stove. Seven beers are produced at this family owned brewery and keen beer drinkers can take part in a tour to see how they are made. Dishes on the menu in the restaurant are made from local produce and the view over the valley is beautiful – take advantage of both on the outdoor timbered deck. A glass of special pale ale was savoured here. The dairy cows grazing contentedly on lush green pasture are the best evidence that there are luscious cheeses on sale at the shop here. There’s a range of camembert, brie, cheddar and feta cheeses. Tastings are welcomed and it’s difficult to stop at one, and even more difficult to decide which cheeses to buy. Our favourites were double cream camembert and smoked club cheddar. Decadent chocolates are made from scratch at the Gabriel Chocolate factory, from cacao beans imported from all the growing regions of the world. Tastings are available at the Chocolate Gallery and include milk and dark chocolates, sauces and drinks. The ginger chocolate was sweet and spicy. Handcrafted wines are the specialty of the House Of Cards. The wine is made only from grapes grown in their own vineyard and the labels on the bottles reflect the inspiration of the winemakers – “you have to play the hand that you are dealt.” I can highly recommend “The Joker” Sweet Rosé. This boutique winery at Yallingup is named for a resident magpie who used to live in the trees on the property and he is featured in the winery’s logo. As well as wine tasting there’s a café with coffee, scones with cream and jam and light lunches. Gourmet platters designed to complement the wines are also available. We bought a bottle each of the 2009 Cabernet Franc and the 2012 Chenin Blanc – delicious! With more than 60 flavours of ice cream to choose from, your dessert desires will be taken care of at Simmo’s Ice Creamery at Dunsborough. The regular flavours like vanilla and chocolate are always available while the more adventurous can try something a little different, like Whiskey Prune or Apple Pie. We had Cinnamon Ginger and Coconut Chocolate. There’s a shady park, an adventure playground and even a mini golf course so you can stay a while, relax and try more than one delicious ice cream. 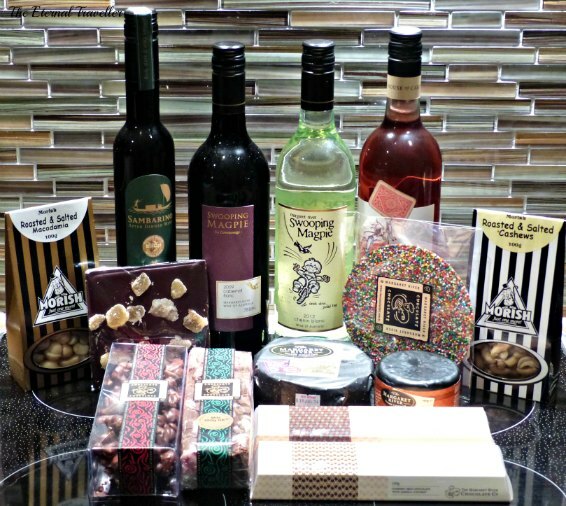 There are many more wonderful food producers which could be visited while holidaying in Margaret River but there are other places to see as well. At the end of the day we were happy with our selection, and also happy with the range of delicious treats we collected along the way. We were there for a week! That’s why we collected goodies along the way, so we could enjoy them and not have to go back! There is so much else to see in the region besides the food and wine. Oh my, that is quite a selection. I could feel my waistline expanding as I read. It was worth every delicious mouthful though! That was a tough day you had there. 🙂 It all looks delicious. Well if it has to be done it might as well be me doing it! so so need to get there! Yes you do. It’s a very easy self drive and self catering holiday and so very beautiful. Elaine, I like the way you think. The sweet ones were my favourites too. Mmmmm, this place sounds heavenly. Always wanted to see this part of WA. It is a stunningly beautiful place. Margaret River is so lovely and you’ve found so many yummy things to eat! We sure did and it wasn’t difficult either! You know what Marsha, I think you should come on holiday with us, and bring Manny with you. Perhaps you’d better not let on to Manny that I am sitting in my little traditional Japanese apartment on our first morning in Tokyo. Thanks. Glad you enjoyed it. Food and wine are definitely the main attractions but we found plenty of other stuff to do as well. Have you been to all the caves? They are fantastic. I’m glad you agree. There is plenty more to sample but time is the enemy! This is where we go to getaway. It’s just a few hours drive away and a place I’ve visited many many times while growing up. Simmo’s is a favourite with my kids now. Thanks for sharing it with your readers. I’m also lucky enough to have their second Margaret River Chocolate Factory just 20 mins away from home as well. It’s a great place for a coffee and cake ( and chocolate). How lucky are you! Maybe you’d better watch your waistline with such deliciousness so close! We had a wonderful week in the Margaret River region. You had me at the chocolate. Then to find 2, then ice cream and bread – too bad Seattle is a bit far away. I’d be there in a shot. Have you been around Griffith NSW? My husband and I lived there from 1969 to 1970. Now people tell me it is the marijuana capital – must be more profitable than onions and rock melons. Great post. I have been to Griffith before, many years ago. It did have quite a reputation once, but not any more. Oranges are grown there now! You should come back to visit. I’d love to – I prefer coming as a “rich” American rather than a poor Aussie. We didn’t have money to travel so our adventures were very limited. However, I found the place and the people very interesting – how they viewed me I have no idea. Unfortunately I was young and inexperienced, 22 going 16, I certainly grew up in that year and a half. There was only one other American couple, so we stood out. My husband has cousins in Sydney and Melbourne – he has cousins all over the place! I admit it: I have a terrible impression of what food must be like in Australia (never having bee there) – and there’s no reason for it – except that maybe, just maybe it was originally colonised by the English – for whom the destruction of food has been an art form. My wife, who has been to Australia, tells me that food is ‘very nice – healthy – plenty of selection’ and she said it enthusiastically – So thank you for being the key that unlocked my unfounded prejudice and sent it packing. David, your comment made me laugh! I think you should come here to visit and see for yourself. I have been to England and the food I had there wasn’t so bad, but I do agree. Ours is much better! We grow most of our own food here too. The only downside is that you will find that food here is much more expensive because of transport costs over long distances. My husband came up with the title, after a day of tasting so many delicious treats. We both felt a little overdone by the end! I’ll tell him how much you liked it.